Bust of Marcus Aurelius in the Musée Saint-Raymond, Toulouse, France. Marcus Aurelius (/ɔːˈriːliəs/; Latin: Marcus Aurelius Antoninus Augustus;[notes 1] 26 April 121 – 17 March 180 CE) was Roman Emperor from 161 to 180. He ruled with Lucius Verus as co-emperor from 161 until Verus' death in 169. Marcus Aurelius was the last of the so-called Five Good Emperors. He was a practitioner of Stoicism, and his untitled writing, commonly known as the Meditations, is the most significant source of the modern understanding of ancient Stoic philosophy. 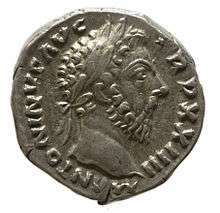 During his reign, the Empire defeated a revitalized Parthian Empire in the East: Aurelius' general Avidius Cassius sacked the capital Ctesiphon in 164. 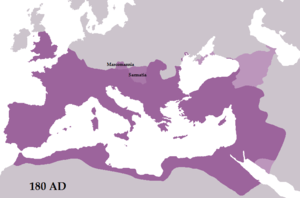 In central Europe, Aurelius fought the Marcomanni, Quadi, and Sarmatians with success during the Marcomannic Wars, although the threat of the Germanic tribes began to represent a troubling reality for the Empire. A revolt in the East led by Avidius Cassius failed to gain momentum and was suppressed immediately. Aurelius' Meditations, written in Greek while on campaign between 170 and 180, is still revered as a literary monument to a philosophy of service and duty, describing how to find and preserve equanimity in the midst of conflict by following nature as a source of guidance and inspiration. The Statue of Marcus Aurelius (detail) in the Musei Capitolini in Rome. The major sources for the life and rule of Marcus Aurelius are patchy and frequently unreliable. The most important group of sources, the biographies contained in the Historia Augusta, claim to be written by a group of authors at the turn of the 4th century, but are in fact written by a single author (referred to here as "the biographer") from the later 4th century (c. 395). Marcus' family originated in Ucubi, a small town southeast of Córdoba in Iberian Baetica. The family rose to prominence in the late 1st century AD. Marcus' great-grandfather Marcus Annius Verus (I) was a senator and (according to the Historia Augusta) ex-praetor; in 73–74, his grandfather, Marcus Annius Verus (II), was made a patrician. [notes 2] Verus' elder son—Marcus Aurelius' father—Marcus Annius Verus (III) married Domitia Lucilla. A bust of Marcus Aurelius as a young boy (Capitoline Museum). Anthony Birley, Marcus' modern biographer, writes of the bust: "This is certainly a grave young man." 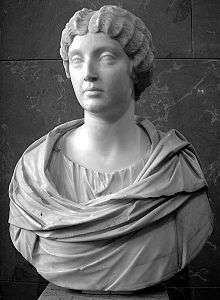 Lucilla and Verus (III) had two children: a son, Marcus, born on 26 April 121, and a daughter, Annia Cornificia Faustina, probably born in 122 or 123. Verus (III) probably died in 124, during his praetorship, when Marcus was only three years old. [notes 3] Though he can hardly have known him, Marcus Aurelius wrote in his Meditations that he had learned "modesty and manliness" from his memories of his father and from the man's posthumous reputation. Lucilla did not remarry. Portrait of Emperor Marcus Aurelius - Palazzo Nuovo (Musei Capitolini). A new set of tutors—Alexander of Cotiaeum, Trosius Aper and Tuticius Proculus[notes 4]—took over Marcus' education in about 132 or 133. Little is known of the latter two (both teachers of Latin), but Alexander was a major littérateur, the leading Homeric scholar of his day. Marcus thanks Alexander for his training in literary styling. Alexander's influence—an emphasis on matter over style, on careful wording, with the occasional Homeric quotation—has been detected in Marcus' Meditations. In late 136, Hadrian almost died from a haemorrhage. Convalescent in his villa at Tivoli, he selected Lucius Ceionius Commodus as his successor, and adopted him as his son. The selection was done invitis omnibus, "against the wishes of everyone"; its rationale is still unclear. As part of his adoption, Commodus took the name Lucius Aelius Caesar. After a brief stationing on the Danube frontier, Aelius returned to Rome to make an address to the senate on the first day of 138. The night before the speech, however, he grew ill, and died of a haemorrhage later in the day. [notes 5] On 24 January 138, Hadrian selected Aurelius Antoninus as his new successor. Marcus became M. Aelius Aurelius Verus; Lucius became L. Aelius Aurelius Commodus. At Hadrian's request, Antoninus' daughter Faustina was betrothed to Lucius. Marcus was appalled to learn that Hadrian would become his adoptive grandfather. Only with reluctance did he move from his mother's house on the Caelian to Hadrian's private home. At some time in 138, Hadrian requested in the senate that Marcus be exempt from the law barring him from becoming quaestor before his twenty-fourth birthday. The senate complied, and Marcus served under Antoninus, consul for 139. Marcus' adoption diverted him from the typical career path of his class. If not for his adoption, he probably would have become triumvir monetalis, a highly regarded post involving token administration of the state mint; after that, he could have served as tribune with a legion, becoming the legion's nominal second-in-command. Marcus probably would have opted for travel and further education instead. As it was, Marcus was set apart from his fellow citizens. Nonetheless, his biographer attests that his character remained unaffected: "He still showed the same respect to his relations as he had when he was an ordinary citizen, and he was as thrifty and careful of his possessions as he had been when he lived in a private household." Antoninus bolstered Marcus' dignity: Marcus was made consul for 140, with Antoninus as his colleague, and was appointed as a seviri, one of the knights' six commanders, at the order's annual parade on 15 July 139. As the heir apparent, Marcus became princeps iuventutis, head of the equestrian order. He now took the name Caesar: Marcus Aelius Aurelius Verus Caesar. Marcus would later caution himself against taking the name too seriously: "See that you do not turn into a Caesar; do not be dipped into the purple dye—for that can happen". At the senate's request, Marcus joined all the priestly colleges (pontifices, augures, quindecimviri sacris faciundis, septemviri epulonum, etc. ); direct evidence for membership, however, is available only for the Arval Brethren. On 1 January 145, Marcus was made consul a second time. He might have been unwell at this time: a letter from Fronto that might have been sent at this time urges Marcus to have plenty of sleep "so that you may come into the Senate with a good colour and read your speech with a strong voice". Marcus had complained of an illness in an earlier letter: "As far as my strength is concerned, I am beginning to get it back; and there is no trace of the pain in my chest. But that ulcer [...][notes 6] I am having treatment and taking care not to do anything that interferes with it." Marcus was never particularly healthy or strong. The Roman historian Cassius Dio, writing of his later years, praised him for behaving dutifully in spite of his various illnesses. A bust of Faustina the Younger, Marcus' wife (Louvre). In April 145, Marcus married Faustina, as had been planned since 138. 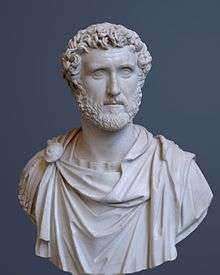 Since Marcus was, by adoption, Antoninus Pius' son, under Roman law he was marrying his sister; Antoninus would have had to formally release one or the other from his paternal authority (his patria potestas) for the ceremony to take place. Little is specifically known of the ceremony, but it is said to have been "noteworthy". Coins were issued with the heads of the couple, and Antoninus, as Pontifex Maximus, would have officiated. Marcus makes no apparent reference to the marriage in his surviving letters, and only sparing references to Faustina. After taking the toga virilis in 136, Marcus probably began his training in oratory. He had three tutors in Greek, Aninus Macer, Caninius Celer, and Herodes Atticus, and one in Latin, Fronto. The latter two were the most esteemed orators of the day. (Fronto and Atticus, however, probably did not become his tutors until his adoption by Antoninus in 138.) The preponderance of Greek tutors indicates the importance of the language to the aristocracy of Rome. This was the age of the Second Sophistic, a renaissance in Greek letters. Although educated in Rome, in his Meditations, Marcus would write his inmost thoughts in Greek. 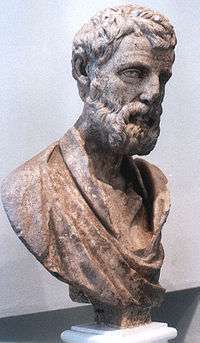 A bust of Herodes Atticus, from his villa at Kephissia (National Archaeological Museum of Athens). Fronto was highly esteemed: in the self-consciously antiquarian world of Latin letters, he was thought of as second only to Cicero, perhaps even an alternative to him. [notes 7] He did not care much for Herodes, though Marcus was eventually to put the pair on speaking terms. Fronto exercised a complete mastery of Latin, capable of tracing expressions through the literature, producing obscure synonyms, and challenging minor improprieties in word choice. Apollonius may have introduced Marcus to Stoic philosophy, but Quintus Junius Rusticus would have the strongest influence on the boy. [notes 8] He was the man Fronto recognized as having "wooed Marcus away" from oratory. He was twenty years older than Marcus, older than Fronto. As the grandson of Arulenus Rusticus, one of the martyrs to the tyranny of Domitian (r. 81–96), he was heir to the tradition of "Stoic opposition" to the "bad emperors" of the 1st century; the true successor of Seneca (as opposed to Fronto, the false one). Marcus thanks Rusticus for teaching him "not to be led astray into enthusiasm for rhetoric, for writing on speculative themes, for discoursing on moralizing texts...To avoid oratory, poetry, and 'fine writing'". 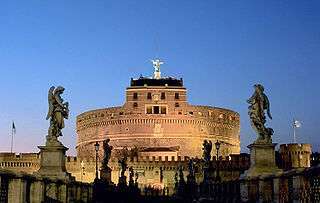 The Mausoleum of Hadrian, where the children of Marcus and Faustina were buried. The first mention of Domitia in Marcus' letters reveals her as a sickly infant. "Caesar to Fronto. If the gods are willing we seem to have a hope of recovery. The diarrhea has stopped, the little attacks of fever have been driven away. But the emaciation is still extreme and there is still quite a bit of coughing." He and Faustina, Marcus wrote, had been "pretty occupied" with the girl's care. Domitia would die in 151. Antoninus Pius, Marcus' adoptive father and predecessor as emperor (Glyptothek). Meanwhile, during the reign of Pius, as a prince and future emperor, Marcus' adoptive brother Lucius Verus received careful education from the famous “grammaticus” Marcus Cornelius Fronto. 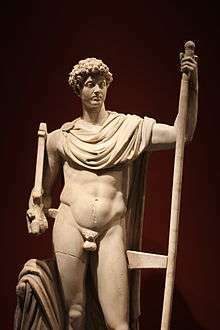 The young Verus was reported to have been an excellent student, fond of writing poetry and delivering speeches. Lucius started his political career as a quaestor in 153, two years before the legal age of 25 (Marcus held the office at 17). In 154, he was consul, nine years before the legal age of 32 (Marcus held the office at 18 and 23), and in 161 was consul again with Marcus Aurelius as his senior partner. Lucius had no other titles, except that of "son of Augustus". Lucius had a markedly different personality from Marcus: he enjoyed sports of all kinds, but especially hunting and wrestling; he took obvious pleasure in the circus games and gladiatorial fights. [notes 9] He did not marry until 164. 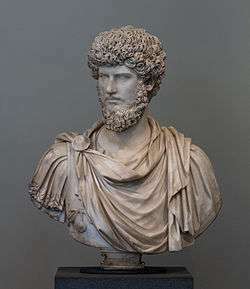 Lucius Verus, Marcus' co-emperor from 161 to Verus' death in 169 (Metropolitan Museum of Art lent by Musée du Louvre). In accordance with his will, Antoninus' fortune passed on to Faustina. (Marcus had little need of his wife's fortune. Indeed, at his accession, Marcus transferred part of his mother's estate to his nephew, Ummius Quadratus.) Faustina was three months pregnant at her husband's accession. During the pregnancy she dreamed of giving birth to two serpents, one fiercer than the other. On 31 August she gave birth at Lanuvium to twins: T. Aurelius Fulvus Antoninus and Lucius Aurelius Commodus. [notes 12] Aside from the fact that the twins shared Caligula's birthday, the omens were favorable, and the astrologers drew positive horoscopes for the children. The births were celebrated on the imperial coinage. This marble portrait depicts Marcus Aurelius (reigned AD 161-180) The Walters Art Museum. 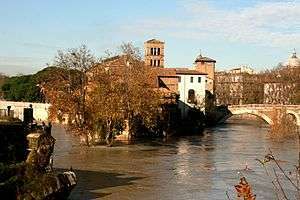 Tiber Island seen at a forty-year high-water mark of the Tiber, December 2008. 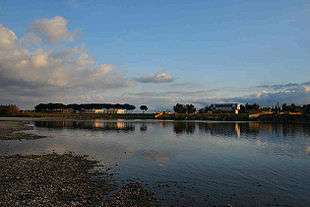 In the spring of 162,[notes 13] the Tiber overflowed its banks, flooding much of Rome. It drowned many animals, leaving the city in famine. Marcus and Lucius gave the crisis their personal attention. [notes 14] In other times of famine, the emperors are said to have provided for the Italian communities out of the Roman granaries. Coin of Vologases IV, king of Parthia, from 152/53. Over the winter of 161–62, as more bad news arrived—a rebellion was brewing in Syria—it was decided that Lucius should direct the Parthian war in person. He was stronger and healthier than Marcus, the argument went, more suited to military activity. Lucius' biographer suggests ulterior motives: to restrain Lucius' debaucheries, to make him thrifty, to reform his morals by the terror of war, to realize that he was an emperor. [notes 16] Whatever the case, the senate gave its assent, and, in the summer of 162, Lucius left. Marcus would remain in Rome; the city "demanded the presence of an emperor". Lucius spent most of the campaign in Antioch, though he wintered at Laodicea and summered at Daphne, a resort just outside Antioch. Critics declaimed Lucius' luxurious lifestyle. He had taken to gambling, they said; he would "dice the whole night through". He enjoyed the company of actors. [notes 17] Libo died early in the war; perhaps Lucius had murdered him. The Euphrates river near Ar-Raqqah, Syria. 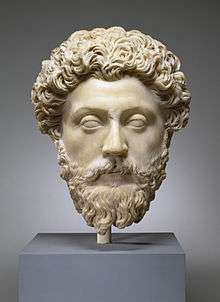 A bust of Marcus Aurelius, Metropolitan Museum of Art, New York. The returning army carried with them a plague, afterwards known as the Antonine Plague, or the Plague of Galen, which spread through the Roman Empire between 165 and 180. The disease was a pandemic believed to be either of smallpox or measles, and may have claimed the lives of two Roman emperors—Lucius Verus, who died in 169, and Marcus Aurelius, whose family name, Antoninus, was given to the epidemic. The disease broke out again nine years later, according to the Roman historian Dio Cassius, and caused up to 2,000 deaths a day at Rome, one-quarter of those infected. Total deaths have been estimated at five million. A possible contact with Han China occurred in 166 when a Roman traveller visited the Han court, claiming to be an ambassador representing a certain Andun (Chinese: 安敦), ruler of Daqin, who can be identified either with Marcus Aurelius or his predecessor Antoninus Pius. In addition to Republican-era Roman glasswares found at Guangzhou along the South China Sea, Roman golden medallions made during the reign of Antoninus Pius and perhaps even Marcus Aurelius have been found at Óc Eo, Vietnam, then part of the Kingdom of Funan near the Chinese province of Jiaozhi (in northern Vietnam). This may have been the port city of Kattigara, described by Ptolemy (c. 150) as being visited by a Greek sailor named Alexander and laying beyond the Golden Chersonese (i.e. Malay Peninsula). Roman coins from the reigns of Tiberius to Aurelian have been found in Xi'an, China (site of the Han capital Chang'an), although the far greater amount of Roman coins in India suggests the Roman maritime trade for purchasing Chinese silk was centered there, not in China or even the overland Silk Road running through Persia. Far more dangerous was the invasion of 166, when the Marcomanni of Bohemia, clients of the Roman Empire since 19, crossed the Danube together with the Lombards and other Germanic tribes. At the same time, the Iranian Sarmatians attacked between the Danube and the Theiss rivers. Due to the situation in the East, only a punitive expedition could be launched in 167. Both Marcus and Verus led the troops. After the death of Verus (169), Marcus led personally the struggle against the Germanic tribes for the great part of his remaining life. The Romans suffered at least two serious defeats by the Quadi and Marcomanni, who could cross the Alps, ravage Opitergium (Oderzo) and besiege Aquileia, the main Roman city of north-east Italy. Bronze statue of Marcus Aurelius, piazza del Campidoglio in Rome. Marcus gave the succession to his son Commodus, whom he had named Caesar in 166 and made co-emperor in 177. This decision, putting an end to the series of "adoptive emperors", was highly criticized by later historians since Commodus was a political and military outsider, as well as an extreme egotist with neurotic problems. In the 1964 movie The Fall of the Roman Empire he was portrayed by Alec Guinness and in the 2000 movie Gladiator he was portrayed by Richard Harris. Both movie plots posited that Marcus Aurelius was assassinated because he intended to pass down power to his adopted son, a Roman general, instead of his biological son, Commodus. Bust of Faustina the Younger, Louvre, Paris. ↑ Commodus was a known consumptive at the time of his adoption, so Hadrian may have intended Marcus' eventual succession anyway. ↑ Although part of the biographer's account of Lucius is fictionalized (probably to mimic Nero, whose birthday Lucius shared), and another part poorly compiled from a better biographical source, scholars have accepted these biographical details as accurate. ↑ These name-swaps have proven so confusing that even the Historia Augusta, our main source for the period, cannot keep them straight. The 4th-century ecclesiastical historian Eusebius of Caesarea shows even more confusion. The mistaken belief that Lucius had the name "Verus" before becoming emperor has proven especially popular. ↑ There was, however, much precedent. The consulate was a twin magistracy, and earlier emperors had often had a subordinate lieutenant with many imperial offices (under Antoninus, the lieutenant had been Marcus). Many emperors had planned a joint succession in the past—Augustus planned to leave Gaius Caesar and Lucius Caesar as joint emperors on his death; Tiberius wished to have Gaius Caligula and Tiberius Gemellus do so as well; Claudius left the empire to Nero and Britannicus, imagining that they would accept equal rank—but all of these arrangements had ended in failure, either through premature death (Gaius and Lucius Caesar) or judicial murder (Gemellus by Caligula and Britannicus by Nero). ↑ The whole section of the vita dealing with Lucius' debaucheries (HA Verus 4.4–6.6), however, is an insertion into a narrative otherwise entirely cribbed from an earlier source. Most of the details are fabricated by the biographer himself, relying on nothing better than his own imagination. ↑ Champlin dates these letters to either summer 162 or early 165. 1 2 Birley, Marcus Aurelius, 229–30. The thesis of single authorship was first proposed in H. Dessau's "Über Zeit und Persönlichkeit der Scriptoes Historiae Augustae" (in German), Hermes 24 (1889), 337ff. ↑ Birley, Marcus Aurelius, 230. On the HA Verus, see Barnes, 65–74. ↑ Mary Beard, "Was He Quite Ordinary? ", London Review of Books 31:14 (23 July 2009), accessed 15 September 2009; Birley, Marcus Aurelius, 226. ↑ Birley, Marcus Aurelius, 228–29, 253. ↑ Birley, Marcus Aurelius, 227–28. ↑ Dio 69.21.2, 71.35.2–3; Birley, Marcus Aurelius, 31. 1 2 Birley, Marcus Aurelius, 31. 1 2 Birley, Marcus Aurelius, 33. ↑ Birley, Marcus Aurelius, 31–32. ↑ HA Marcus 2.2, 4.9; Meditations 1.3; Birley, Marcus Aurelius, 37; McLynn, 21–22. ↑ Birley, Marcus Aurelius, 41–42. ↑ HA Hadrian 23.10, qtd. in Birley, Marcus Aurelius, 42. ↑ Birley, Marcus Aurelius, 42. On the succession to Hadrian, see also: T.D. Barnes, "Hadrian and Lucius Verus", Journal of Roman Studies 57:1–2 (1967): 65–79; J. VanderLeest, "Hadrian, Lucius Verus, and the Arco di Portogallo", Phoenix 49:4 (1995): 319–30. ↑ HA Hadrian 23.15–16; Birley, Marcus Aurelius, 45; "Hadrian to the Antonines", 148. ↑ Dio 69.17.1; HA Aelius 3.7, 4.6, 6.1–7; Birley, "Hadrian to the Antonines", 147. ↑ Dio 69.21.1; HA Hadrian 24.1; HA Aelius 6.9; HA Antoninus Pius 4.6–7; Birley, Marcus Aurelius, 48–49. ↑ Birley, Marcus Aurelius, 49–50. ↑ HA Marcus 5.6–8, qtd. and tr. Birley, Marcus Aurelius, 50. ↑ Birley, Marcus Aurelius, 80–81. 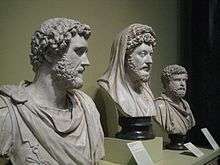 ↑ Dio 69.22.4; HA Hadrian 25.5–6; Birley, Marcus Aurelius, 50–51. Hadrian's suicide attempts: Dio 69.22.1–4; HA Hadrian 24.8–13. ↑ HA Antoninus Pius 5.3, 6.3; Birley, Marcus Aurelius, 55–56; "Hadrian to the Antonines", 151. 1 2 HA Marcus 6.3; Birley, Marcus Aurelius, 57. ↑ Birley, Marcus Aurelius, 57–58. 1 2 Birley, Marcus Aurelius, 89. ↑ Birley, Marcus Aurelius, 90–91. ↑ HA Antoninus Pius 10.2, qtd. and tr. Birley, Marcus Aurelius, 91. ↑ Birley, Marcus Unko Aurelius, 91. ↑ HA Marcus 3.6; Birley, Marcus Aurelius, 62. 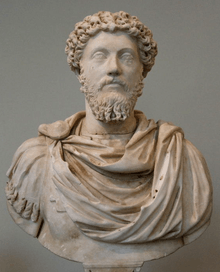 ↑ Vita Sophistae 2.1.14; Birley, Marcus Aurelius, 63–64. ↑ Aulus Gellius, Noctes Atticae 9.2.1–7; Birley, Marcus Aurelius, 64–65. ↑ Birley, Marcus Aurelius, 67–68, citing E. Champlin, Fronto and Antonine Rome (1980), esp. chs. 3 and 4. 1 2 Birley, Marcus Aurelius, 65–67. ↑ Cf., e.g. : Ronald Mellor, review of Edward Champlin's Fronto and Antonine Rome, The American Journal of Philology 103:4 (1982): 461 and passim. 1 2 Birley, Marcus Aurelius, 69. ↑ Ad Marcum Caesarem 4.6 (= Haines 1.80ff); Birley, Marcus Aurelius, 76–77. ↑ Ad Marcum Caesarem 3.10–11 (= Haines 1.50ff), qtd. and tr. Birley, Marcus Aurelius, 73. ↑ Birley, Marcus Aurelius, 77. On the date, see Champlin, "Chronology of Fronto", 142, who (with Bowersock, Greek Sophists in the Roman Empire (1964), 93ff) argues for a date in the 150s; Birley, Marcus Aurelius, 78–79, 273 n.17 (with Ameling, Herodes Atticus (1983), 1.61ff, 2.30ff) argues for 140. ↑ Ad Marcum Caesarem 3.2 (= Haines 1.58ff), qtd. and tr. Birley, Marcus Aurelius, 77–78. ↑ HA Marcus 3.5–8, qtd. and tr. Birley, Marcus Aurelius, 94. ↑ Ad Antoninum Imperator 1.2.2 (= Haines 2.36), qtd. and tr. Birley, Marcus Aurelius, 95. ↑ Birley, Marcus Aurelius, 94–95, 101. ↑ Meditations 1.7, qtd. and tr. Birley, Marcus Aurelius, 94–95. ↑ Ad Marcum Caesarem 4.11 (= Haines 1.202ff), qtd. and tr. Birley, Marcus Aurelius, 105. ↑ Birley, Marcus Aurelius, 247 F.1. ↑ Birley, Marcus Aurelius, 206–7. ↑ Birley, Marcus Aurelius, 107. ↑ Birley, Marcus Aurelius, 107–8. ↑ Birley, Marcus Aurelius, 108. ↑ Inscriptiones Graecae ad Res Romanas pertinentes 4.1399, qtd. and tr. Birley, Marcus Aurelius, 114. ↑ Suetonius, Nero 6.1; HA Verus 1.8; Barnes, 67; Birley, Marcus Aurelius, 158. See also: Barnes, 69–70; Pierre Lambrechts, "L'empereur Lucius Verus. Essai de réhabilitation" (in French), Antiquité Classique 3 (1934), 173ff. ↑ HA Verus 2.9–11; 3.4–7; Barnes, 68; Birley, Marcus Aurelius, 108. 1 2 3 4 Birley, Marcus Aurelius, 117. 1 2 Birley, Marcus Aurelius, 118. 1 2 "Tulane University "Roman Currency of the Principate"". Tulane.edu. Retrieved 2012-06-15. ↑ HA Antoninus Pius 12.8; Birley, Marcus Aurelius, 118–19. ↑ HA Marcus 19.1–2; Birley, Marcus Aurelius, 278 n.9. ↑ "Portrait of the Emperor Marcus Aurelius". The Walters Art Museum. ↑ Birley, Marcus Aurelius, 118, citing Werner Eck, Die Organization Italiens (1979), 146ff. ↑ Birley, Marcus Aurelius, 122–23, citing H.G. Pfalum, Les carrières procuratoriennes équestres sous le Haut-Empire romain I–III (Paris, 1960–61); Supplément (Paris, 1982), nos. 142; 156; Eric Birley, Roman Britain and the Roman Army (1953), 142ff., 151ff. ↑ Birley, Marcus Aurelius, 123, citing H.G. Pfalum, Les carrières procuratoriennes équestres sous le Haut-Empire romain I–III (Paris, 1960–61); Supplément (Paris, 1982), no. 141. 1 2 Birley, Marcus Aurelius, 120. ↑ Ad Antoninum Imperator 1.2.2 (= Haines 2.35), qtd. and tr. Birley, Marcus Aurelius, 128. ↑ De eloquentia 1.12 (= Haines 2.63–65), qtd. and tr. Birley, Marcus Aurelius, 128. ↑ Ad Antoninum Imperator 1.2.2 (= Haines 2.35); Birley, Marcus Aurelius, 127–28. ↑ Ad Antoninum Imperator 1.2.4 (= Haines 2.41–43), tr. Haines; Birley, Marcus Aurelius, 128. ↑ HA Antoninus Pius 12.7; Birley, Marcus Aurelius, 114, 121. ↑ Lucian, Alexander 27; Birley, Marcus Aurelius, 121–22. On Alexander, see: Robin Lane Fox, Pagans and Christians (Harmondsworth: Penguin, 1986), 241–50. ↑ HA Antoninus Pius 7.11; Marcus 7.2; Birley, Marcus Aurelius, 103–4, 122. ↑ De bello Parthico 1–2 (= Haines 2.21–23). ↑ HA Marcus 8.9, tr. Magie; Birley, Marcus Aurelius, 123–26. On Lucius' voyage, see: HA Verus 6.7–9; HA Marcus 8.10–11; Birley, Marcus Aurelius, 125–26. ↑ HA Verus 9.2; Corpus Inscriptionum Latinarum 3.199; Birley, Marcus Aurelius, 130–31. ↑ Birley, Marcus Aurelius, 131, citing Anné Épigraphique 1958.15. ↑ Ad Antoninum Imperator 2.1–2 (= Haines 2.94ff. ); Birley, Marcus Aurelius, 132. ↑ Fergus Millar, The Emperor in the Roman World, 31 BC – AD 337 (London: Duckworth, 1977), 6 and passim. See also: idem. "Emperors at Work", Journal of Roman Studies 57:1/2 (1967): 9–19. ↑ "Pius, one of longest-serving emperors, became infirm in his last years, so Marcus Aurelius gradually assumed the imperial duties. By the time he succeeded in AD 161, he was already well-practised in public administration." This quote is from philosopher Iain King, writing about Aurelius in Thinkers At War, published August 2014, accessed November 2014. ↑ Dio 72.11.3–4; Ad amicos 1.12 (= Haines 2.173); Birley, Marcus Aurelius, 132. ↑ Dio 72.11.3–4; Birley, Marcus Aurelius, 132, citing De nepote amisso 2 (= Haines 2.222); Ad Verum Imperator 2.9–10 (= Haines 2.232ff.). ↑ Birley, Marcus Aurelius, 133, citing Geza Alföldy, Konsulat und Senatorenstand (1977), Moesia Inferior: 232 f.; Moesia Superior: 234f. ; Pannonia Superior: 236f. ; Dacia: 245f. ; Pannonia Inferior: 251. ↑ Tr. Cary, ad loc. ↑ Michael Grant (30 December 2011). The Climax Of Rome. Orion. p. 15. ISBN 978-1-78022-276-9. ↑ HA Marcus 1.1, 27.7; Dio 71.1.1; James Francis, Subversive Virtue: Asceticism and Authority in the Second-Century Pagan World (University Park: Pennsylvania State University Press, 1995), 21 n. 1. ↑ Francis, 21 n.1, citing Justin, 1 Apologia 1; Athenagoras, Leg. 1; Eusebius, Historia Ecclesiastica 4.26.9–11. ↑ Eusebius, Historia Ecclesiastica 4.26.9–11, qtd. and tr. Francis, 21 n. 1. ↑ Herodian, Ab Excessu Divi Marci 1.2.4, tr. Echols. ↑ This is the conclusion of King's biography of Aurelius, Thinker at War, published August 2014, accessed November 2014. ↑ History of the Decline and Fall of the Roman Empire — Volume 2 by Edward Gibbon Ch. 16 Pt. 5. 1 2 3 "DIR Marcus Aurelius". Roman Emperors. 2001-01-30. Retrieved 2012-06-15. 1 2 3 4 5 6 7 8 9 10 11 12 13 Jona Lendering. "Marcus Aurelius". Livius.org. Retrieved 2012-06-15. ↑ Gregory Hays. Introduction to Marcus Aurelius Meditations Weidenfeld and Nicholson London 2003 pp xlviii–xlix. Cary, Earnest, trans. Roman History. 9 vols. Loeb ed. London: Heinemann, 1914–27. Online at LacusCurtius. Accessed 26 August 2009. Rolfe, J.C., trans. The Attic Nights of Aulus Gellius. 3 vols. Loeb ed. London: Heinemann, 1927–28. Vols. 1 and 2 online at LacusCurtius. Accessed 26 August 2009. Butler, H.E., trans. The Orator's Education. 5 vols. Loeb ed. London: Heinemann, 1920–22. Online at LacusCurtius. Accessed 14 September 2009. Magie, David, trans. Historia Augusta. 3 vols. Loeb ed. London: Heinemann, 1921–32. Online at LacusCurtius. Accessed 26 August 2009.